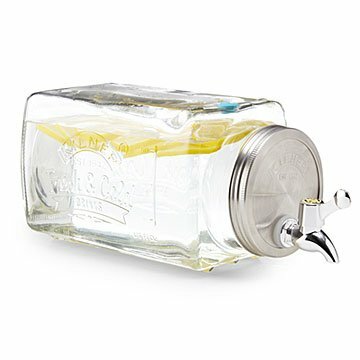 Cold drinks on tap, stored in a mason jar-style dispenser that takes up minimal space in the fridge. Designed to maximize refrigerator space, it won't take up precious room on the top shelf, due to its unique rectangular shape and top-placed tap. Mason jar-style design in clear glass lets beautiful tea, fruit, wine, and cocktail colors show through, tempting all to imbibe liberally. Place the container vertically on the counter, unscrew the lid, and fill it easily through its wide mouth opening. Let your fridge's mad chilling skills do the rest. Made in China. The drink dispenser is great for laying flat in the fridge to get cold water from. However, it is kind of small and doesn't last more than half a day for a family of four. Refilling it is a hassle as the spout and screw top are finicky and it leaks if you don't get it just right. Phenomenal Dispenser. It truly maximizes my space. I have a very busy lifestyle. It just takes a few seconds to fill these (I bought 2 of them) with my favorite iced tea with lemon. Extremely convenient and space-saving and I love the glass. Bought this for my best friend's birthday - she and her family are avid ice tea drinkers and I figured it'd be perfect for them (and the fridge - which is often at capacity). She liked it very much but noted the O ring which seals the spigot to the jar leaked some and that you have to make sure it is completely dry before "assembly". I love this so far. Hopefully the lid/spout lasts and doesn't rust over time. The jar was heavy duty & we wanted something that fit in the fridge. This was perfect, except the spigot was very wimpy plastic. My mom loves this for her hot summer days in Arizona!